More than educational, physical and mental attributes one may have, a person’s success in life will, in fact, be determined by their character. It will decide how far a person goes and how long they stay there. I recently read the book entitled The Noticer Returns in which the author discussed the need for a gold standard for raising our youth. He was teaching a group of young couples who, like so many today, were trying to juggle their efforts between raising their children and pursuing the American dream. He never identifies the gold standard but makes it known that we definitely need to find it because of the encroachment of world values in to the lives of our children. Statistics show that of all the young people of high school age presently engaged in church. 70% will be gone by age 22 and 80% by the time they are 29. These figures are alarming to say the least. In my mind, this gold standard should encompass a vehicle that would enable parents to engraft the godly character and ideals of our Founding Fathers into the hearts and minds of their children. Shortly after I finished this book, I was given a copy of a writing which I believe could be the “Silver Bullet” to answer this great need. It is a book by my longtime friend, Winston Menzies, which teaches the principals and ideals of which I speak. The other part of the equation is parents who know otherwise. The book I speak and feel so strongly about is The Character Trait Journal. It contains over twelve years of material that will enrich the hearts and minds of our youth and do the same for the parents who teach it. I sincerely believe this journal is a “Godsend” for such a time as this. 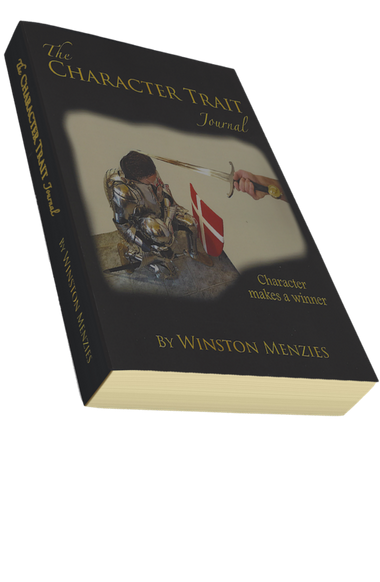 The Character Trait Journal, written by my friend and fellow minister in the Gospel of God’s grace, Winston Menzies, is both timely and much needed. It seems we find ourselves ministering to a generation that has moved far, far away from the Biblical moorings that have, in the past, produced men and women of great character. It is not that there are none today who have pinned their worth to the moorings of Biblical character, but far less. There are surely not as many as are needed to stem the tide of the ever-encroaching chracterlessness that has besieged our nation, yeah, even our world. It is for this reason The Character Trait Journal is so needed. For those who read, contemplate, strive to put these character traits to practical use in their daily living, I am persuaded that they will be immeasurable help. Each trait is written from personal knowledge and the deep experience of having seen the blessings of God upon their application. To this end, all who will read and heed them will likewise be blessed! It is my prayer that this work will be widely used for God to challenge everyone who comes in contact with it to live a life of true character. I pray that they may attain to that which was said about our Lord in Luke 2:52: “And Jesus increased in wisdom and stature, and in favor with God and man.” Surely this is the best measure of the results of Biblical character, and where properly applied, it would rescue the present generation and save the next. The Character Trait Journal is a book about more than educational, physical and mental attributes one may have. It’s about a person’s success in life that will in fact be determined by their character. This book will help the reader decide how far they go and how long they stay there. Excerpts from various selections of The Character Trait Journal. Thank God life has its blessings, rewards and positive, sunshiny days. However, to live and prepare for the day of trouble is wisdom. We know there are certainly going to be some calamities down the road. There are going to be some misfortunate events, troubles and accidents in everyone’s lives. Some crumble in face of tough problems and unfair odds but we have to decide that, with God’s help, we are not going to be one of them. Solomon spoke to this saying, “If you faint in the day of adversity, your strength is small.” (Proverbs 21:10) For those who are in covenant with Him, God says, “In time of trouble He shall hide (you) in His pavilion; in the secret place of His tabernacle. He shall hide (you); He shall set (you) high upon a rock.” (Pslam 27:5) He goes on to say in Psalm 50:15 that you can “call upon Me in the day of trouble; I will deliver you, and you shall glorify me.” What incredible promises! Life is a battle for all of us. There are, thankfully, a whole lot more sunshiny days than dark ones but it is the dark days that have the power to devastate. It is the days days that cause the weak to despair and give up. Adversity and conflict are simply unavoidable in life. For this reason and to encourage us to be prepared, the Master counsels is to count the cost before we ever step out on the field of battle. Before we even begin a battle, we need to decide if we have the gear to go all the way and obtain the victory. In order to get the true picture of what we are facing He poses this questions: “What king, going to make war against another king, does not sit down first and consider whether he is able to with Ten thousand to meet him who comes against him with twenty thousand? Or else, while the other is still a great way off, he sends a delegation and ask conditions of peace.” (Luke 14;31, 32) In other words, if we are looking for a fair fight is this life, we are going to be sadly disappointed. Don’t. Our adversary is the devil will be working in and through people and circumstances right in our very neighborhood, the community we live in, the company and ministry we are working for. The question is can you still keep the faith and believe you have the victory even when we are outnumbered two to one? Even two against one would be a blessing compared to what we might have to face on occasion. If we handle these conflicts successfully, positive results will strengthening our relationships and cause us to gain even more ground in life. Allowing them to defeat us will harm our relationships and cause us to lose ground and, for a time, may destroy our happiness. Purchase The Character Trait Journal to read more…. Winston Menzies, is the son of an Air Force pilot and Squadron Commander. He graduated from Texas A&M University with a B.S. degree were he also received his pilot's license and was commissioned a 2nd Lieutenant in the United States Army. Upon entering active duty, he graduated from the Airborne, Ranger, Pathfinder, and Jumpmaster schools. He served as a platoon leader in the 82nd Airborne Division and was later selected to be aide to the Commanding General. Subsequently he volunteered twice to command rifle companies in Vietnam. After three years, He chose to resign his commission as a Captain to begin his business career. For his service he was awarded the Silver Star, two Bronze Stars, and two Army Commendation Medals. Copyright © 2019 The Character Trait Journal. Book Landing Page By Rara Theme. Powered by WordPress.